Need help, advice or information? Digital locks, mortice locks, padlocks - everything lock related - we are the top lock shop on the internet with two decades of experience in trade and consumer marketplaces. Members of the Master Locksmiths Association. 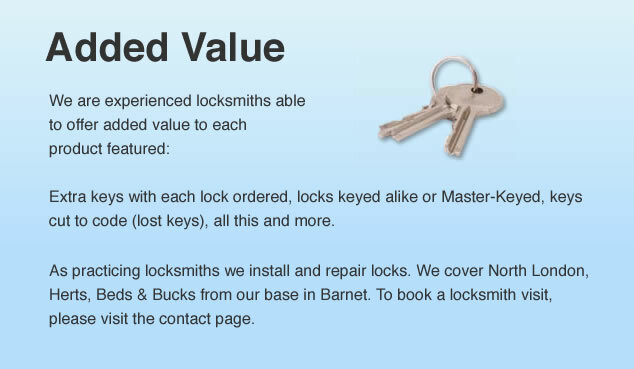 Lockcentre.com are Trade members of the Master Locksmiths Association (Membership No 000119) and our 20 years of practical experience of hands on locksmithing and of retailing physical security products has enabled us to assemble a catalogue of products with the consumer in mind. We are able to back this up with our Help Line (020 8275 2620) offering the public practical advice on the selection and installation of locks and safes. We have an extensive range of Padlocks, Access Control, Cylinders, Digital Locks, Door & Window Fittings, Furniture Locks, Mortice Locks, Mul-T-Lock, RimLocks, Safes, Vehicle Security, but if you don't find what you're looking for be sure to drop us an email or telephone us. The product knowledge of our sales department, supported by product availability from a network of major wholesalers and manufacturers, guarantees that we are able to meet our customers needs promptly and competitively. As e-commerce wholesalers supplying both consumer and trade, we have accounts with numerous suppliers all over the country, and our buying power enables us to pass on to our customers the advantages of competitive buying.